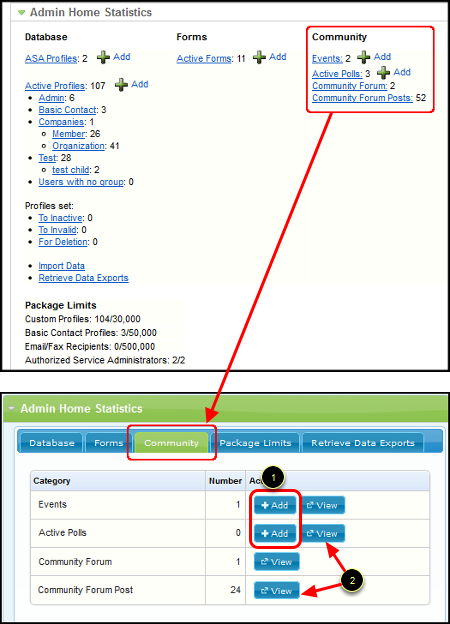 We've streamlined the admin statistics area to give you a better view of the important information. The admin shortcuts area now features improved editing and management interfaces. We've reworked the menu system to increase usability. The changes below are indicative of an effort to streamline the look of our site and in no way infers that this is at a higher priority than the coming exciting functionality enhancements. We have an incredible new member on our team who will be solely focused on updating the Admin Template, Admin Home, Menus, etc. and to provide you with a much more user friendly look/feel. Our engineering team is still focused on launching the new exciting product functionality in the coming months! This tab lists all of the profiles in your database. The numbers are broken down by group ("Admin", "Basic Contact", "Companies", etc.) and status ("Active", "Inactive", "Invalid", etc.). To view profiles simply click the "View" button next to the appropriate group. To add new profiles simply click the "Add" button next to the appropriate profile type ("Add" next to "ASA Profiles" allows you to add additional ASAs and next to "Total Active Profiles" allows you to add additional profiles to any of your database groups). This tab shows you the number of active forms you have and allows you to add a new form (1) as well as view the form list (2). This tab shows the number of events, polls, community forums, and forum posts. You can add new events or polls by clicking the "Add" button next to the category (1). To view any of the categories, click the "View" button (2). 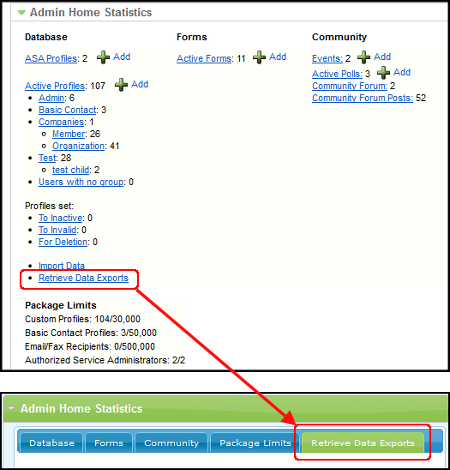 This tab shows your current MemberClicks package limits and usage. This tab allows you to access any of the data exports you've requested. If you receive an email notifying you that a data export is complete, this is the area where you'll find the file. The customizable admin home control panel has also been updated. You'll notice in the comparison below that the sections have been cleaned up and we've made it easier for you to manage them. Now, only 4 items/buttons will initially appear per section. To view more, simply click the "More" button (1). Doing this will provide an expanded view where you're able to access the additional buttons for that section (2). 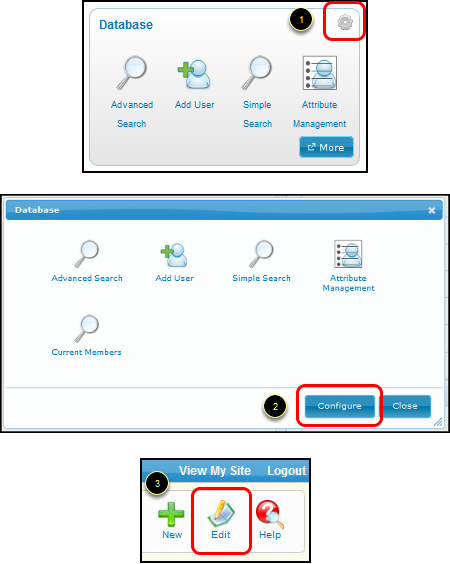 To edit a section click the gear icon in the top-right corner (1) or "Configure" from the expanded view (2) or "Edit" in the top-right corner of the admin home page (3). I know MemberClicks has been working on this revamp for a long time, so I don't want this comment to come off as disparaging, but I'm failing to see what's particularly more helpful about the new UI. It's got prettier colors and icons, to be sure, but the explanation above of what's new sounds like mostly a new look -- which will require more clicking in several places to get to various parts of the interface. For example, the current Statistics section will now live in 5 separate tabs, which require clicking to view. Maybe if MemberClicks has had feedback that the current UI overwhelms users with too much information, this streamlined tabbed interface is an improvement; otherwise, it just seems to require extra clicks to view what we can see today at-a-glance. Allowing only four functions/icons per section in the user-configurable left side also has me scratching my head: how does clicking on a More button, waiting for the screen to reload, just to click on a "shortcut" icon improve things? (I'd probably bypass the More button and just use a menu item rather than doing the extra click and page re-load to get to an icon.) On the right side, clicking "Active Forms" currently opens a list of the forms, whereas the new interface seems to require clicking the Forms tab and then clicking View Forms to get to the same place. Why create more clicks to get places, when no new information is being displayed? Finally, it wasn't initially clear from looking at the page what "New" and "Edit" at the far top right refer to, since the panels now each have their own configuration icon to click for editing; I had to read the explanation to understand. I'd think these buttons should be moved to the bottom (or maybe top) of the left side, where the panels these actions actually apply to reside. Again, I don't mean this to be overly negative without even seeing the new UI in action; perhaps it's just that the explanation above doesn't touch on all the small niceties and improvements which have been baked in. Otherwise, it just seems like a cosmetic makeover which doesn't really make it easier or faster to get anywhere, and in some cases makes it take an extra step. I agree with Eric that I don't want this to sound disparaging for your work, but my first reaction was, "Why is Memberclicks spending all this energy in the Administration Home page and not on actual functionality?" It is our USER EXPERIENCE that is the most important. After reading Eric's comments, I couldn't agree more, that it seems more elegant and simple. It may help with training new admins, but doesn't change the functionality of the product. Thanks for the effort. I truly do appreciate it. I do ask that future priorities be to the product functionality that we can use to affect our users. It comes down to how priorities are determined. I would be curious to see if a new Home Admin screen had more votes than other feature requests. If so, that's fine. If not, then how do priorities get assigned? First, it's great to have customers who are as passionate about our product as we are. The initial feedback is awesome! I want to clear up a couple of things about this release too. It's important to note that, as Eric mentioned, there isn't a lot of functional improvement. That was intentional. Front-end and back-end development are two different skill-sets, so we took the opportunity to get this gain without sacrificing the velocity on the larger projects. Definitely understand your concerns when reading this update and also seeing everything that's planned here, but rest assured the team has remained full-steam-ahead on the larger projects. Yes, the general feedback has been that the current statistics area is too overwhelming and we wanted to fix that. Clicking the more botton won't require a page reload; it's pretty snappy. The section specific buttons allow you to go directly to that section's edit page. The current interface requires two clicks. The New button creates a new section. Today it requires more clicks and knowing exactly how to do it. Thanks for the feedback on the updated Admin Home Interface. It is incredibly valuable to MemberClicks and how we will enhance/change our product in the future. Duncan did a fantastic job explaining the reasons for the updates and hopefully my added explanation to the summary at the top of the page will help to clear up the confusion for others. Our engineers are still working nonstop on the larger projects and we are utilizing another resource to update the look/feel. I am excited to work with everyone in the Beta Group and know the new forum will be a very easy way for you all to have direct influence in designing functionality that will benefit the product. The feedback you all provided above will be used directly in our analyzing the changes to the new Admin Home and has already been brought to our design/engineering team. As the Product Manager here, I will ensure your feedback is immediately processed and used in product development at MemberClicks! Hey Duncan, Can you give us a quick preview/overview of some of the new user based functionalities that are coming up? 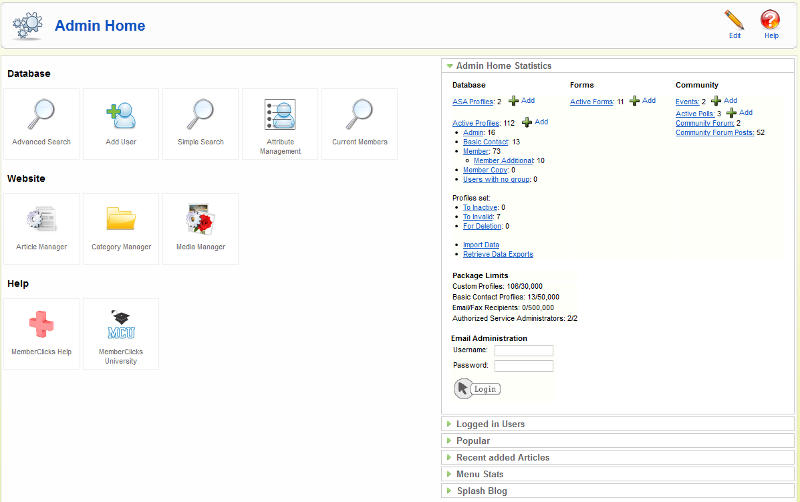 The Admin page revamp looks great but we are more interested in user enhancements. Thanks! One quick note about the New Admin Home Interface. When you first load your Admin Home screen, there may be a few issues with the appearance. The easiest way to fix this is to clear your cache/cookies and reload your browser. You should then be able to see the update changes to the Admin Home screen correctly. With many updates, this may be a necessary action to correctly view the updates. We apologize for any confusion and hope this will clear up any issues you may have. As always, if this does not seem to work for you, please do not hesitate to email/call our help desk and check back for more updates on here throughout the day. A screenshot of what i see is attached. If you refresh your browser a couple of times, that should do the trick. If not, please email help@memberclicks.com so the team can dig deeper into the issue. My feedback: Streamlining the site is important and looks nice. I wonder if you've underestimated the impact these seemingly simple changes have on your customers' ability to use your system. Volunteer-staffed organizations with members who work for small, mid & large companies use a diverse array of software, firewalls, corporate security procedures, etc. When you say "clear your cache" that's not always a simple solution. Right now, I have volunteers using a wide variety of IE versions, Google Chrome, Firefox, etc. and their ability to access your system depends on their (diverse) companies' IT policies, their own IT skills, and how much (unpaid) time they are willing to spend to get Memberclicks to work for them. Is Memberclicks willing to provide more access to the Help Desk (for a finite period) for customers who do not have the paid staff or budget to add ASAs to communicate and troubleshoot how to get the new Admin page working? I'm a relatively new user and admin to our group, so maybe I have missed something. 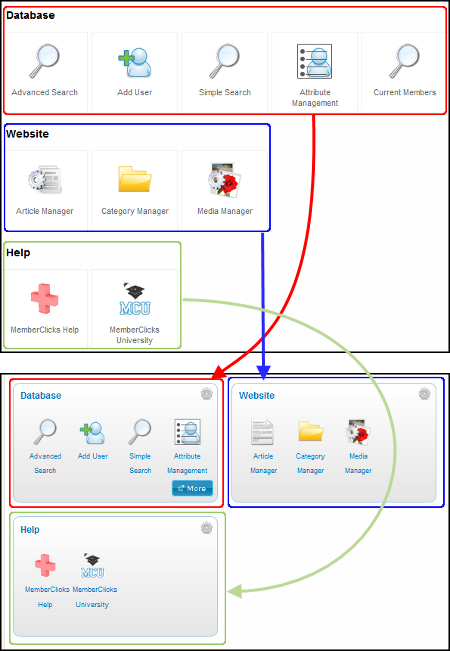 But my first impression of the new Admin page was, "why is it spread out so much vertically?" I used to see everything on one screen, and now I have to scroll down to see the whole page. And there seems to be no reason for that except that it was a deliberate choice. The size of the buttons and the space between them is larger than necessary, making the whole page less easy to navigate..
Users have a variety of display devices, and those using some smaller ones, like netbooks, will be particularly inconvenienced by this design. Hopefully you will reconsider this. I agree with Bill about taking what fit on a single screen and making a user now need to scroll a bit to see everything. I used to be able to see every time I logged in, for instance, if there were any newly-registered users, which we set by default to an Invalid status until we verify and approve them -- but I now need to remember to scroll down to see if there are any Invalid users. But my bigger dislike of the interface revamp at this point is limiting each box on the left side to four items plus a See More button, which then pops up a separate window. To me, this proliferation of windows and extra button clicks is more "cluttered" than what we had before. The look is definitely cleaner and newer, so props to your designer for that -- but style should never trump usability in a UI re-design, and this just isn't as easy to use. I suppose the "solution" is for me to spend some time redesigning my home page to have more boxes with four or fewer items each, so I never need to click on the More button -- I just don't see why this was necessary. Isn't the whole idea of this part of the page to give users easy one-click access to the parts of the back-end they use? Editing the items in the different Section panels of the Admin Home page could be made so much easier if the Edit screen allowed me to view all my sections at once, and drag-and-drop items between them. I currently have 8 items in my first "Control Panel" section. I want to reduce that to four, so I don't have to click the More button and open a new screen every time I want to access one of these shortcuts. The way it currently works, I'll probably (1) take a screenshot of what I have now, (2) edit the existing section, deleting four items, (3) close that section, and (4) open a different section or create a new one, (5) re-create each of the four items I deleted one-at-a-time. Imagine how much easier this would be if I opened a configuration screen and I could simply select and drag four items from one section to another, then save. One other suggestion for now, and then I'll quiet down. At the bottom, there's a blue search bar. The Advanced Search, which was cobbled on in the past year to the old interface still seems cobbled on. 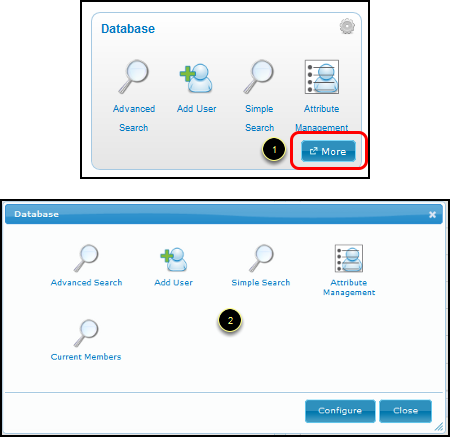 On the left, it shows "Quick Search", which is a label for the field to the right of it. But just to the right of the green search button is the text "Advanced Search". It looks the same as "Quick Search" (similar font and color), but this is a link to a different screen. It's the UI's job to make the difference clearer. (I know I've had newbie users find this unintuitive in the past until I pointed it out to them.) I think "Advanced Search" (or even "Go To Advanced Search") should be a button, not text. See the attached quick mock-up. The only thing my users must go to the admin screen for is to view receipts and look up members in the Database. They must also at times export lists. However, there is no way on the Admin MENU to get to the export center. And the statistics on the right side only show up for Admins as far as I can tell. They can't see it, nor am I sure I want them to. So, users must learn how to configure their admin screen to add the Export center link. Not gonna happen. Instead I added it to a menu on the actual website, but then they ave to swap between the two interfaces. Very inconvenient. Can we have this added to an Admin menu? 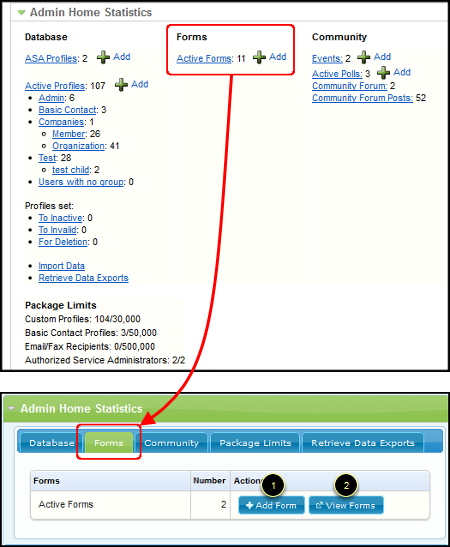 Jani, the Export Center is still accessed from the Admin Home page: on the right side, in the Admin Home Statistics box, there's a row of tabs along the top -- and Retrieve Data Exports is the last tab on the right. That being said, I meant to note previously this seems like a design flaw, and one which would be easy to fix. The box is called Statistics, but retrieving exports is an action. Why is it a tab in the Admin Home Statistics box? Further, clicking this tab takes you off the Admin Home page (to the Export Center page); it's bad UI to have every other tab on the Admin Home page open a pane on the same page, but this tab takes you to an entirely different page. I would suggest simply removing Retrieve Data Exports from this area of the home page entirely. (I know, I know, it used to be here. But it was probably misplaced then, and it's now even more out of place with the new UI.) Instead, make Export Center a menu item under the Database menu, or Export Report a menu item under the Reports menu. Users who have proper access privileges will just access it from the menu -- or put a shortcut icon in one of their custom sections on the left. 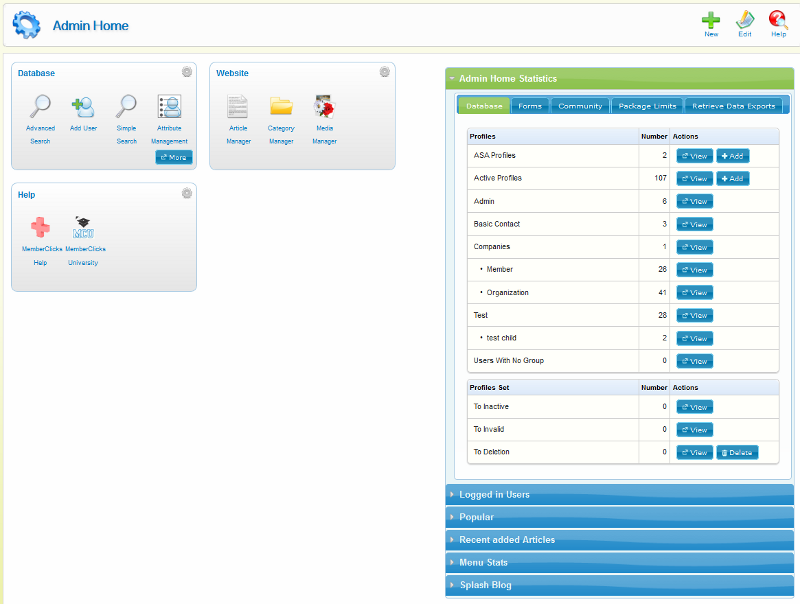 I like the new look and functionality of the admin page. It is much more user-friendly and my assistants can find what they need (e.g. Export Center) much faster. Great job MemberClicks!!! PLEASE give me back all of my shortcuts in the Control Panel w/o needing to click see more, the advantage of those shortcuts was that I could click on them right from my landing page. Please, please, please give them back!!!!!!!!!!!!!!!!!!!!! Thank you for the feedback... keep it coming! We want to ensure we are able to hear everything you think, both positive and negative. With regards to the number of icons available for one quick click, we are all getting together to discuss other options. We are listening to some of that frustration and we are going to see what we can do to change/update it. These changes will not be overnight, so please be patient. We do want to ensure all of the needs are heard from our customer base and then provide a good solution. We will be processing everything and I will be getting back to you with some more questions/ideas in the next day or so. Linda, we are happy to hear you enjoy it! Thanks for the feedback! PLEASE get it back to a single screen height - we don't need bells and whistles that make our work take more time - we need quick turnaround access. These are volunteers who don't have all day to mess around with edits. e.g. you never added the "save" button to the top of the profile edit page. This is another timesaver that was suggested. I realize you are trying to expand your client base and may think bells and whistles will make you more attractive - but once they have purchased it, they are all going to be asking for efficiencies, too! Thanks. Thanks for your feedback! We have a lot of ideas/feedback coming from many different organizations in how the Admin Home should appear and where functionality should be located. The save button is one example and we have already moved that up in priority. There have been a great deal of changes made to the Admin Home that were requested by a very large group of MemberClicks current customers. Of course we would enjoy providing updates that would entice new Sales, but our changes to the Admin Home were driven by existing customers and for existing customers. Our old Admin Home contained hard to read, small blue links, that were constantly an eye sore/strain to our current customers. We have reached out to ask if customers would want to "hide" the groups on the right side of the screen to create a single screen height, but in the end it would still require another click to view the groups. Would anyone have thoughts on how you envision the right side groups being laid out? Would "hiding" the groups make it better and then you could pop open another modal? We are absolutely open to suggestions on this, but want to be able to still provide a more readable screen for our customers. We are constantly working to improve our product based upon a large swath of feedback and are determined to create a product that will be best for all current customers moving forward. The feedback you have given is great and we do look to tweak a few things in the next few releases. Hopefully, you will like some of the updates we make to Admin Home soon, based from your feedback. I agree with people that the stats-at-a-glance aspect of the previous version was nice, but all of our staff have responded enthusiastically to the new modern look and tab/accordion navigation. This could be specific to our organization since all of our users with admin access are internal staff with customized dashboards, but we don't rely heavily on those sidebar links so the additional second that it requires to click to see stats aren't really slowing anyone down. Perhaps there could be a happy medium where you can simply customize what appears on your stats pane the same way you can customize the dashboard? There are really only a few that we pay attention to regularly. 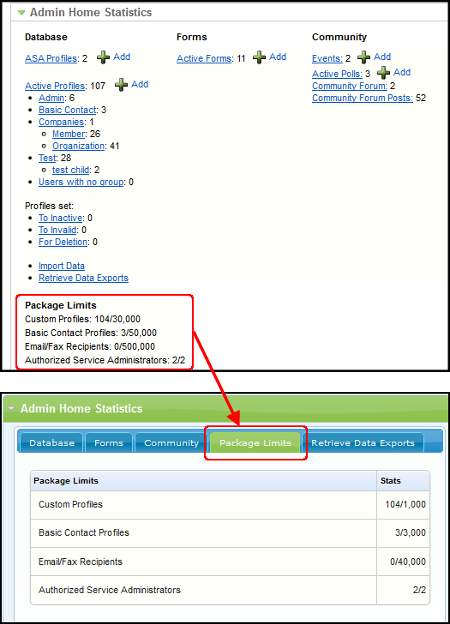 Most of our key features are linked to directly from the custom dashboard or top navigation. I don't know if it is the new interface, but I tried to send an email via the contact center today and I could not get to the Send button. The window would not allow me to scroll down to the scheduling area below the message. SOLUTION - you just have to zoom out your page til you can see more . You'll find the save button actually is there if you zoom out (not in). I went back and tried it again. It worked normally - no zooming required. thanks for the help.